Okay, I was going to write a whole thesis about sexism as applied to Harley Quinn, along with a detailed chronology of logical positivism as viewed through the world of comics, but I woke up with a bug today and a migraine, so I'm just going to post a picture of a man in a hat. ....rocking the white Fedora and popped trenchcoat collar. Now, because I believe in value for your dollar, you get not only a lovely picture of a man in a hat, but a snapshot of John Jones's (a.k.a. The Manhunter from Mars) origin. See, back in The Day, heroes (and villains) often decided they would become heroes (or villains) for a specific reason, which were verbalized to the reader. This has the lovely effect of giving clarity of purpose and transparency of motivation to a character. For slow-witted folks like me, this has the added bonus of always letting us know why a character is acting the way he or she does. And that, my friends, is one reason why I like the Silver Age. Sorry for my delayed comment(s,) but between waiting for you to have enough posts to form a linklist for your Diabolu entry, and my avoidance of anything else "DC Challenge" related over the last month, we find ourselves here. Anyway, especially specific to J'Onn, this post puts me in mind of John Jones, Manhunter of Integrity. 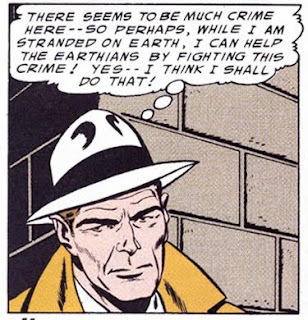 He's a Sleuth from Outer Space, and he darned well ought to have his fedora back. Oh, hello, just saw your post. Because m.c. mentioned that I went and searched I-HoD for the "Jack Webb" entry and found it, and you hit the nail on the head with your usual incisveness. The "too rough around the edges for a drawing room detective, and too tame for noir" summed it up perfectly, and now I'm rethinking my John Jones: Noir Detective idea. He lies somewhere in that middle ground. I'm glad you agree about the Fedora. It really completes the detective look, and it would be a nice homage to the Silver Age.